Happy Friday lovelies! Yes I know it’s not Saturday but this is an extra post for you! A diy project to be specific. I’ve teamed up with Zen from Hapiness Wherever to bring you some easy diy projects. Our first project is boho chic! I love the boho chic style and whilst there were quite a few diy projects to choose from, I decided on upcycling a pair of white skinny jeans that I was going to give to charity. I wanted this diy project to be kept simple and affordable. You will need the following for this boho chic diy. Decide where you’d like to put your fringe and measure, using the fringe, how much is needed. Cut the pieces of fringe required. Using your hot glue gun attach the fringe to where you’d like it to go. Be careful not to burn yourself like I did! Ouch! Leave to dry for at least 24 hours before wearing. That’s it! So simple and easy to put together. I can wear these jeans with a flowy kimono and camisole. Or, just style with an off the shoulder boho style top. 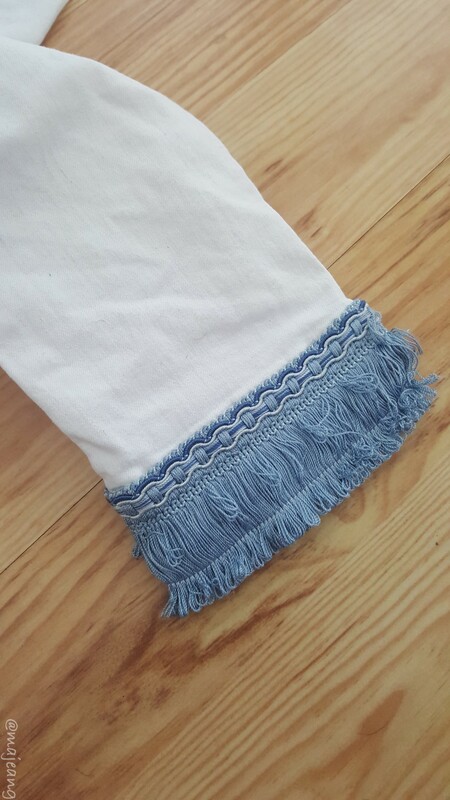 You could also cut a pair of old jeans and add fringe to the legs, just be sure to only add fringe on the outside and not the inner thigh. So what do you think? Did I achieve the boho chic style? What’s your favourite boho chic diy that you’d like to do? Don’t forget to check out Zen’s blog to see what her boho chic diy is all about! As always, thank you for reading and don’t forget to subscribe if you haven’t already.